Diwali is over, but my sweet cravings are not … hmmmm I know thats really not good. But what do I do ? 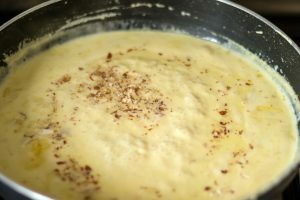 I was so craving for some rabri( read madam rabri / almonds pudding) this morning, and had to , had to make it. And I promised myself, that i’ll have it in moderation! I guess, moderation is the key, and having a sinful treat, at times, in moderation is perfectly fine. 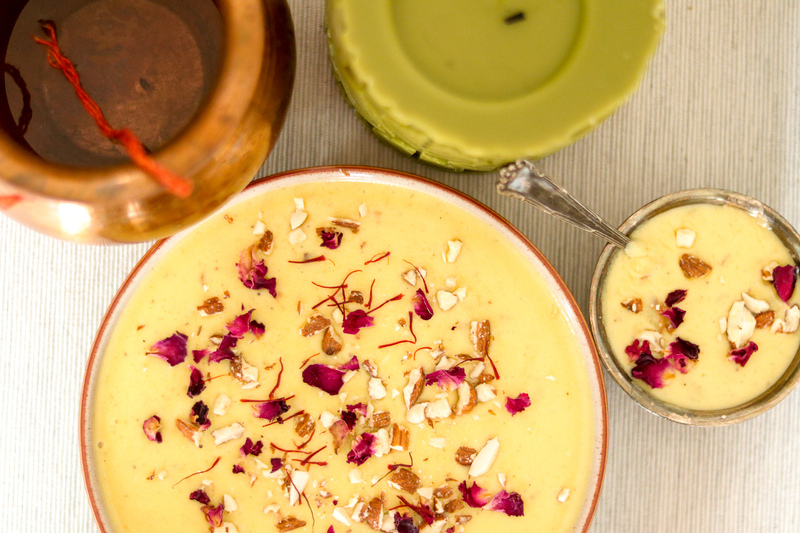 I have loved rabri since childhood, it is a bit heavy, but its sweet , thick creamy texture has my heart. 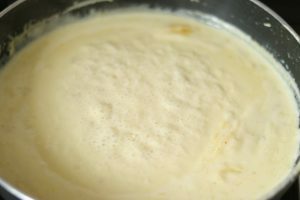 My mum cooks rabri at home, using milk and lots of malai (cream). 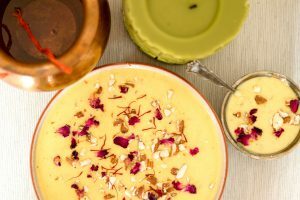 This recipe of almond rabri ,has the similar cooking method, just with the addition of almond paste, to give this a nutty almond flavour, and the goodness and richness of almonds. I usually have this chilled, but you can have this warm as well. 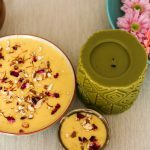 If you are done eating rabri, and still some is left over, try freezing these, in kulfi moulds, and making badaam (almonds) kulfi. It tastes really rich and creamy.Just a small tip !! Thats what I do with my rabri the next day . Blink blink! 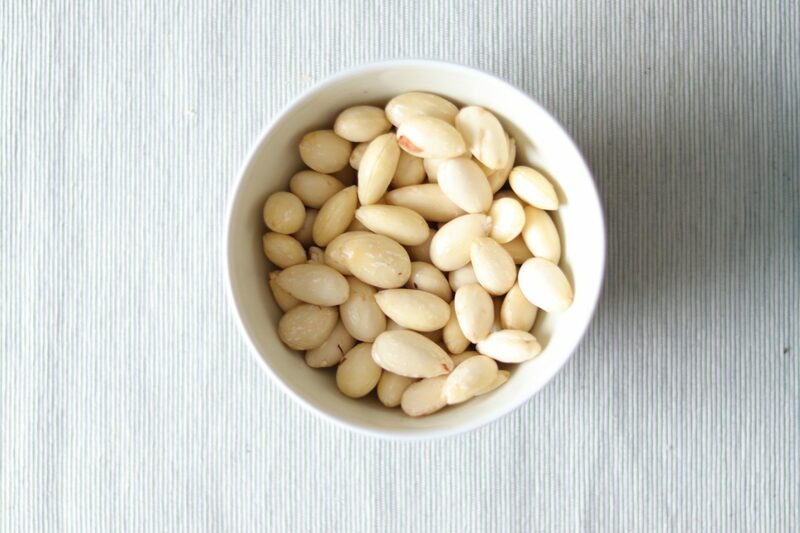 If you do not have soaked almonds you can use blanched almonds. Just soak it in water half an hour before cooking the rabri. In one bowl, warm 1/2 a cup of milk, and add saffron to it.Keep aside. Once the soaked almonds are ready and peeled, make a paste using soaked almonds and milk. 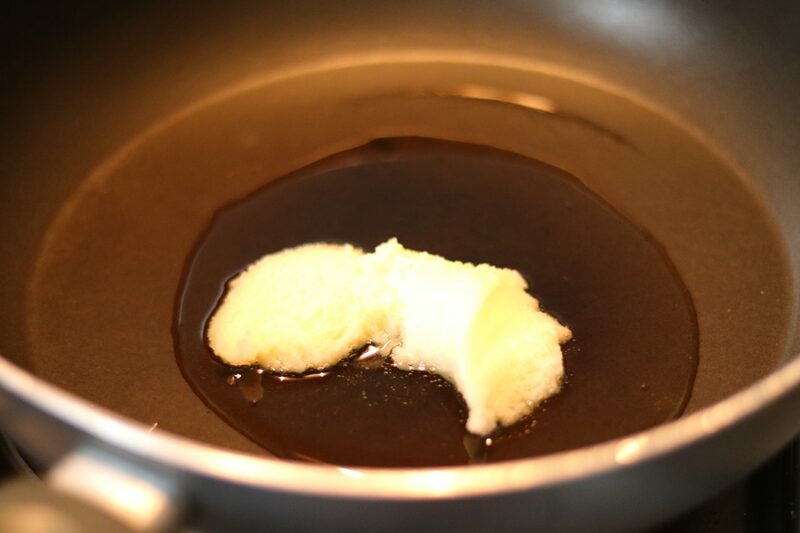 Now add ghee in a thick bottomed pan, and cook almond paste in it ,on slow heat for 15-20 minutes. 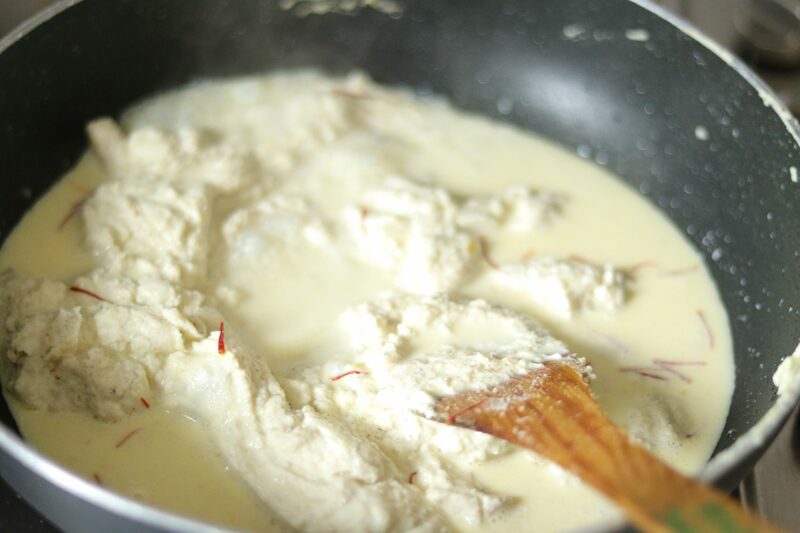 You will know the almond paste is cooked, when the ghee is all absorbed, and the paste starts to reduce and thicken. It sticks to the spatula, leaving the pan. Keep stirring the paste, so that it does not burn or stick to the bottom. 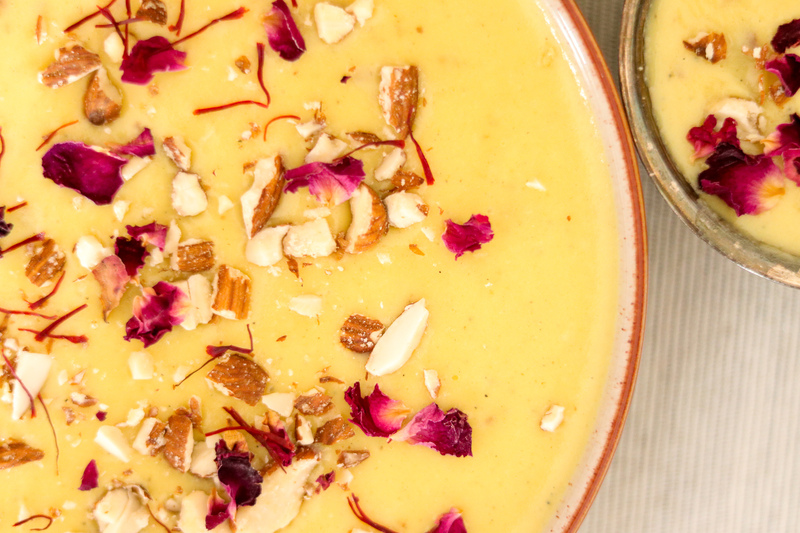 Once the almonds paste is cooked, add saffron milk.Stir the paste and the milk nicely. Add rest of the milk, and let it simmer on slow heat for almost 20-30 minutes. Do not forget to stir at regular intervals, and scrape off the milk of the sides and bottom of the pan, and mix well. You will have to keep doing this till the milk is reduced to more than half of the qty. It becomes really creamy and thicker in consistency, in the end. 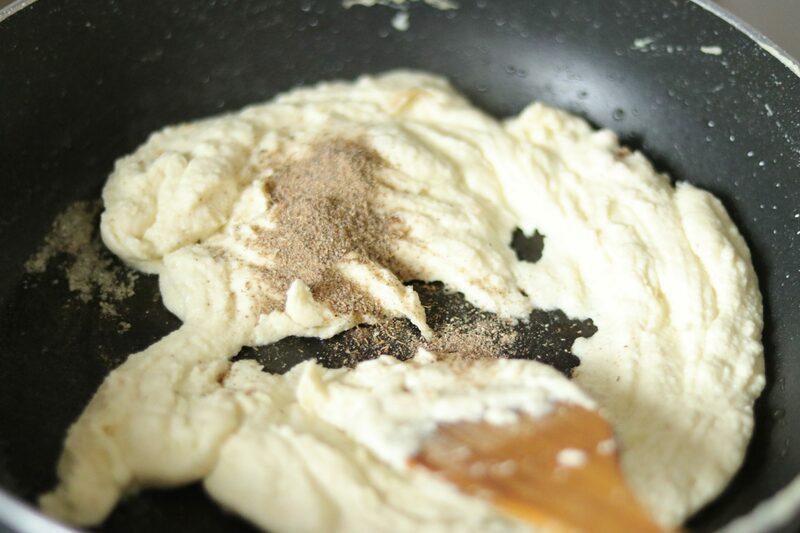 Now add the cream /malai, cardamom powder and mix well. Let it simmer for another 5 minutes. 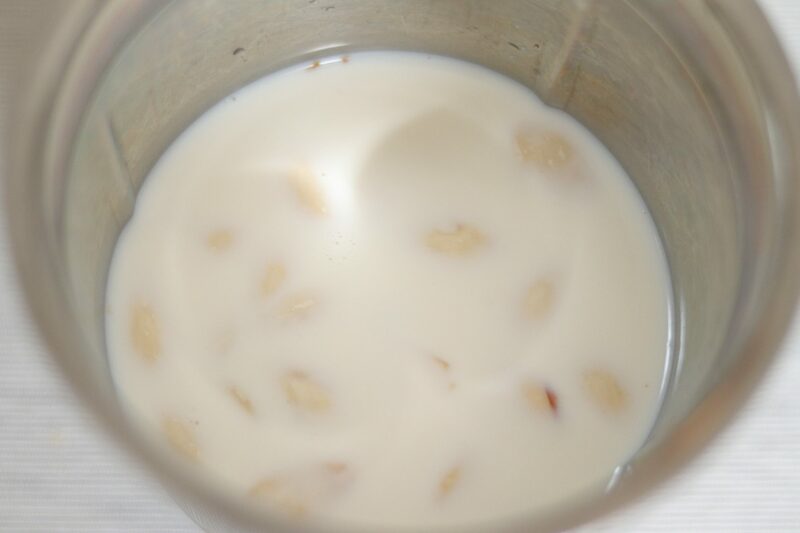 Add chopped almonds (optional), and sugar at last, and bring to a boil whilst stirring, and scraping milk off sides. Turn off the heat. put it in a bowl. 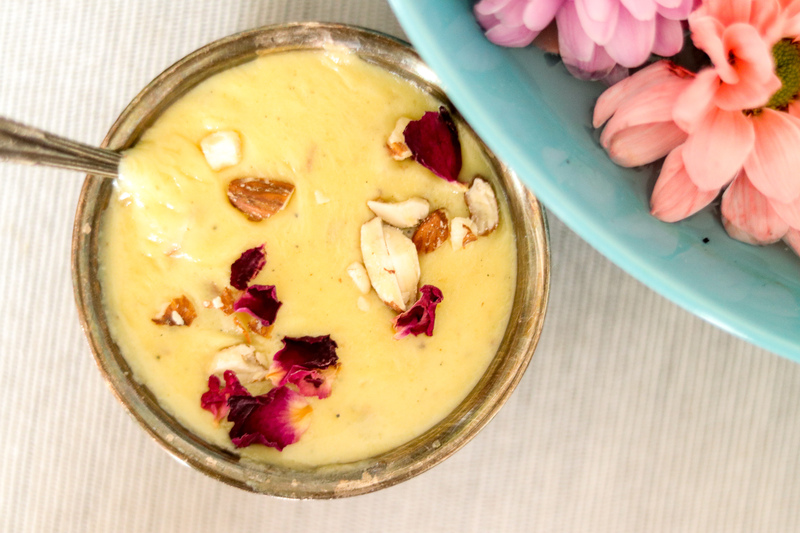 Garnish with chopped almonds, rose petals and saffron stands. Serve hot or chilled. 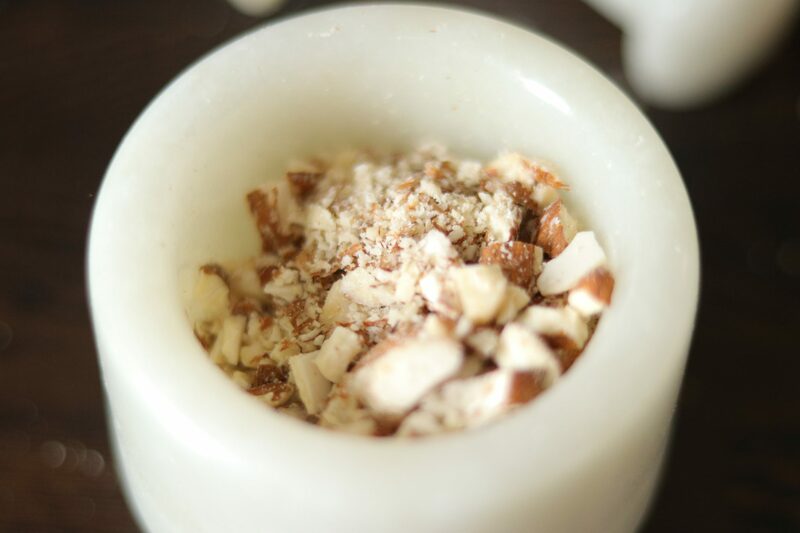 Once the soaked almonds are ready and peeled, grind them with 1/2 cup milk to make a paste. 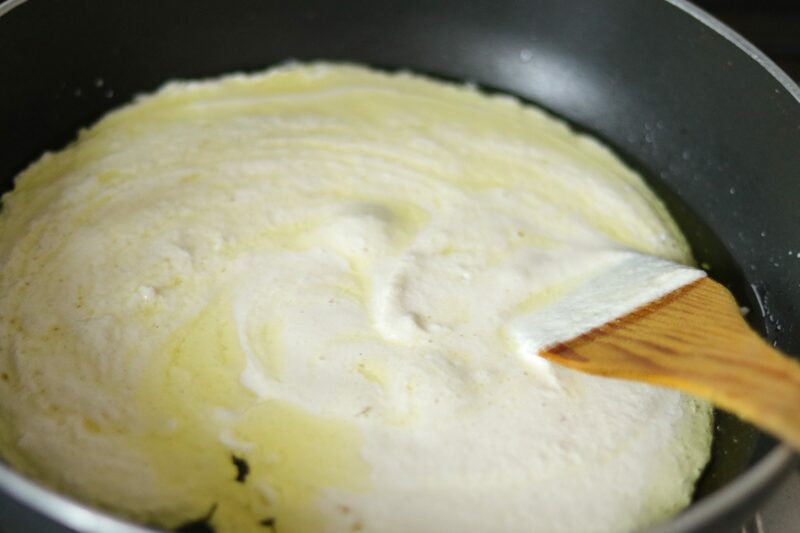 Now add ghee in a thick bottomed pan, and cook almond paste in it ,on slow heat for 15-20 minutes. 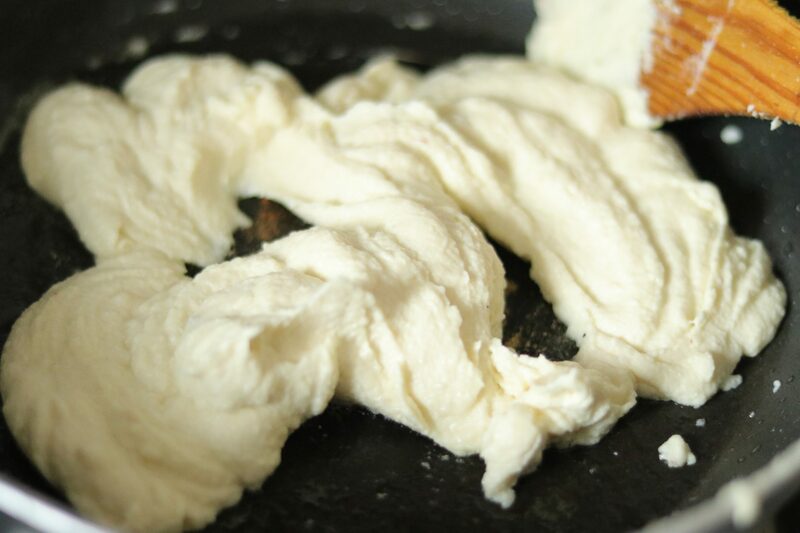 You will know the almond paste is cooked, when the ghee is all absorbed, and the paste starts to reduce and thicken. It sticks to the spatula, leaving the pan. Keep stirring the paste, so that it does not burn or stick to the bottom. 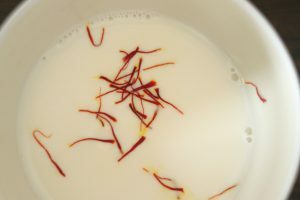 Once the almonds paste is cooked, add saffron milk.Stir the paste and the milk nicely. Add rest of the milk, and let it simmer on slow heat for almost 20-30 minutes. Do not forget to stir at regular intervals, and scrape off the milk of the sides and bottom of the pan, and mix well. You will have to keep doing this till the milk is reduced to more than half of the qty. It becomes really creamy and thicker in consistency, in the end. 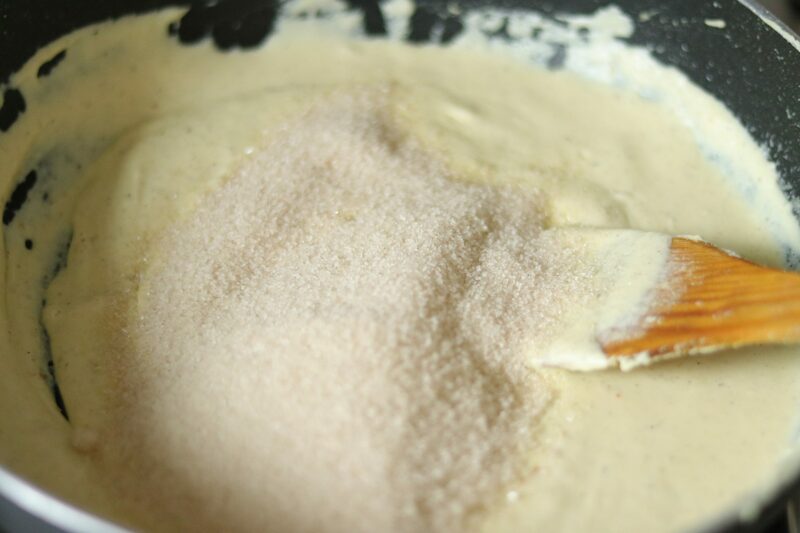 Now add the cream /malai, cardamom powder and mix well. Let it simmer for another 5 minutes. Always use a thick bottomed pan for cooking this. 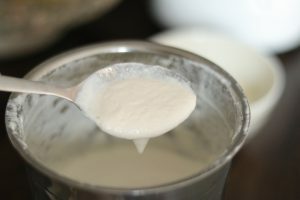 Do not forget to stir at regular intervals, and scrape off the milk of the sides and bottom of the pan, and mix well. You will have to keep doing this till the milk is reduced to more than half of the qty. 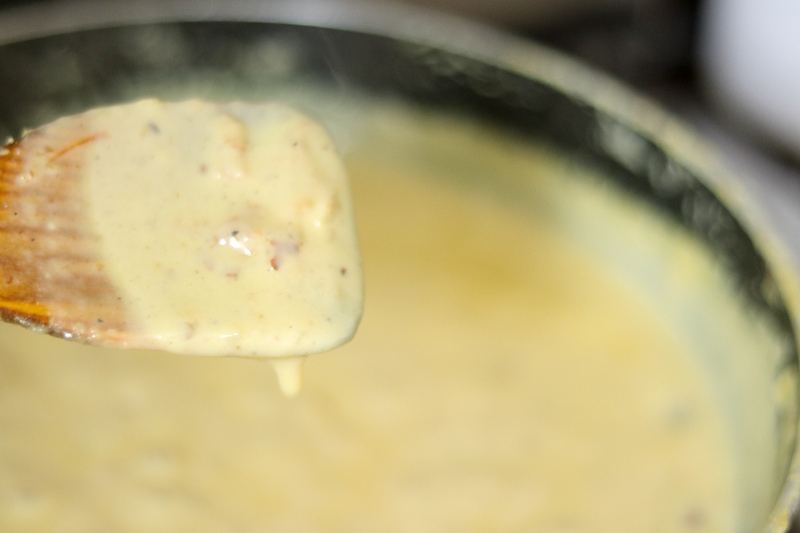 It becomes really creamy and thick in consistency, in the end.